The work and goals of this project are twofold. The Fresh Focus effort focuses on ramping up production of fruits and veggies in order to provide more free, fresh produce to students. The Community Connections effort engages with the student community, and increases internal awareness as well as awareness across campus about food systems and food security. These interdependent and interrelated efforts increase academic diversity and create conversations related to food and culture that directly support the use of the increased produce offerings. 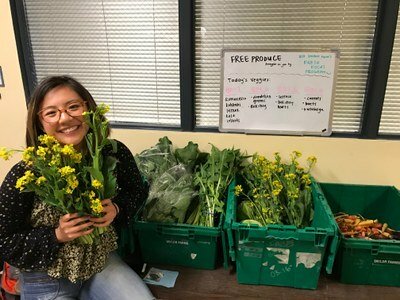 In 2014, two Student Farm students, Nicole Lesnett and Kiko Barr, began delivering SF produce to the Associated Students of UC Davis Pantry, where it was made available, free of charge, to all UC Davis students. 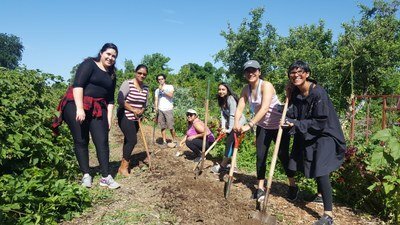 This student led initiative took on a new direction in the Fall of 2016, with the beginning of a UC Global Food Initiative-funded food access project at the Student Farm. In response to a UC system-wide study of student food access and security, and in accordance with the Global Food Initiative’s mission to feed the world by 2050, the University of California pledged $3.3 million over two years to improve access to fresh and nutritious food for its student populations. The Student Farm integrated this directive into its existing programs, resulting in the development of two efforts aimed at improving UC Davis student access to fresh produce. The Community Table Project aims to increase the amount of food produced at the Student Farm, in conjunction with student led programs that connects this fresh produce with The Pantry and Fruit and Veggie Up Program. The increased production at the Student Farm will make it possible to deliver larger quantities of produce to these two programs. Our produce is available free of charge for students at both the ASUCD Pantry and the CSAA Fruit and Veggie Up Program. Community building is an important part of the Community Table Project. The Community Connections effort aims to broaden the diversity of students involved in our campus food system. This will increase the percentage of the student population that is aware and ready to use the increased produce offerings. Aiming to engage diverse student communities, the Community Table Project team will work with faculty and staff to engage students in conversations about food and culture. Events will be hosted at the Student Farm in conjunction with various departments on campus to celebrate and acknowledge our shared histories and connections to food. Learn More! Click here to learn more about what the CTP team has been doing.